So, we have a token. Time to create front end part and try to send it between accounts. 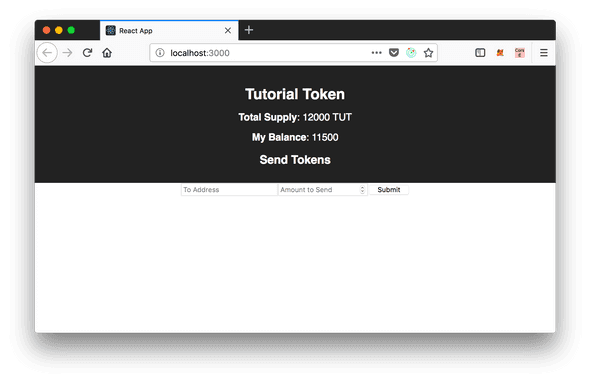 Go read the first part if you missed it, you’ll learn how to create a token and run local ethereum network. By default react-scripts don’t allow to import stuff outside the src folder. We fixed it by making that symlink. Redux is drizzle-react dependency. Drizzle-react-components allow to create basic interface in a few seconds. Here we imported DrizzleProvider from drizzle-react and provided it with required options. DrizzleProvider works a lot like Redux provider, and is actually based on it. It allows us to use drizzleConnect to inject data from drizzle state to props. Here we used drizzleConnect to get values from drizzle state. Check the mapStateToProps, we need accounts to get accounts controlled by current node. In our case there will be only one account – the one that is currently active in MetaMask. We need drizzleStatus to avoid calling uninitialized web3 instance. Finally we need TutorialToken contract reference, to be able to call it’s methods. In this example I used drizzle-react-components: ContractForm and ContractData. They allow to display contract related info and call it’s methods. After checking their internals I can’t recommend using them. drizzle-react-components depend on purecss and also don’t give much freedom in making custom layout for your app. If you read the first part of the article – you should already have the local ethereum network running. If not – I highly recommend to do it. 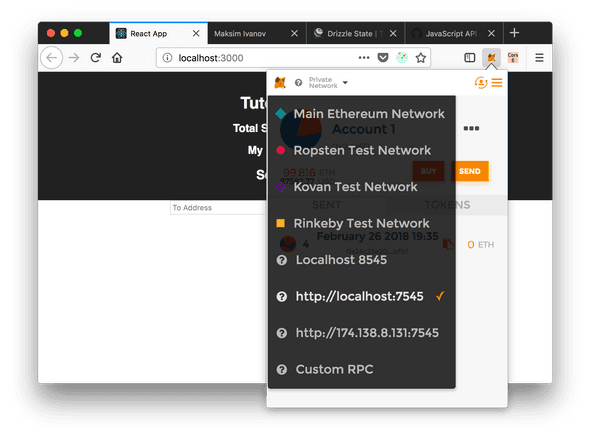 Download and install the MetaMask browser extension. After you’ve done it – connect to local network. In our case it will be https://localhost:7545. Now import new user using private key. You can get private key by clicking on key icon in ganache. Use the key of the first account. As you remember this is the account that got all the initial Tutorial Tokens. Reload the page. You should see that you have a bunch of Tutorial Tokens. Copy the any other wallet address from ganache and try to send it using the form. This is it. Now you can create your own tokens with little to no effort. Use your new power wisely. Now you can add authorization to this app and build the whole ICO dashboard around it. Stay tuned, I’m going to make more tutorials about Ethereum and DAPPs.